Winter is the coldest of all seasons. The winter season lasts from November to January. During this, cold winds run from the north. Every morning, the dense sheet of fog hides the sun. All people wear warm clothes like jackets and sweaters. To avoid winter, people muffle quilts and blankets at night. To get warm, People burn the bonfire and sit around it. The time for opening school is rescehduled in winter. 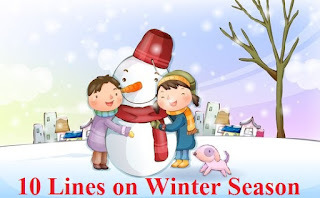 In schools, winter holidays are announced for about 10 to 20 days. Christmas festival and New Year also fall in winter. In winter, people also like to sunbathe very much. Rich variety of Fruits and vegetables come in the winter.